More than 500 undergraduate and graduate students presented their latest research at the SDSU ninth annual Student Research Symposium held at the SDSU campus March 4-5, 2016. Over 20 awards for excellence were presented in recognition of outstanding oral and poster presentations. MARC scholar, Charles Moreno, a psychology major and graduating senior was one of the students who received a Provost award for his poster presentation entitle Recall and Recognition Discriminability in Healthy Aging. This study examined the effect of age as a continuous variable on each of the California Verbal Learning Test-Second Edition (CVLT-II) score of recall and recognition discriminability in sample of healthy adults. Multiple regression analyses revealed that performance on each CVLT-II measure of recall and recognition discriminability significantly decreases as age increased, controlling for gender and education (ps<.001). The findings indicate that recall and recognition discriminability scores from the CVLT-II decline with increasing age. These measures might provide more accurate assessments of recall and recognition abilities by quantifying target words recalled relative to intrusion errors (recall) and hit rates relative to false positive rates (recognition). We congratulate Charles on his outstanding achievement and express our appreciation of his mentor, Dr. Paul Gilbert, faculty in the Department of Psychology and his lab team for the support and guidance they provide and continue to provide our MARC scholar. 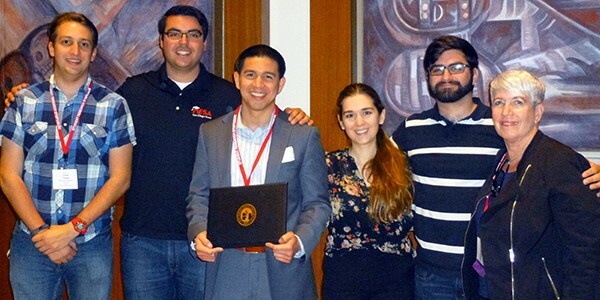 MARC alumnus, Esteban Vasquez-Hidalgo, currently a student in the SDSU/Claremont Joint Doctoral program in Computational Science, participated as a judge at this year’s symposium. As a MARC scholar just a few years ago, he also found himself presenting his research just as the 550 students did this weekend. Gary Warth from the San Diego Union Tribune, highlighted the symposium in an article published on March 7, 2016. To read the article click on the link below.